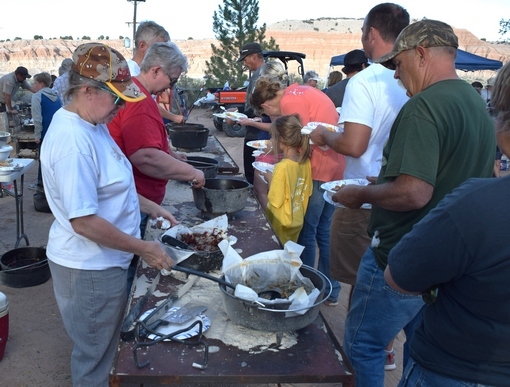 Some of the over 200 people who attended the Dutch Oven Cook-Off at Cathedral Gorge State Park on Sept. 15 came from far away, without even knowing the event was going to take place. Such was the case with a man and his family from Texas and a woman on vacation from Italy. 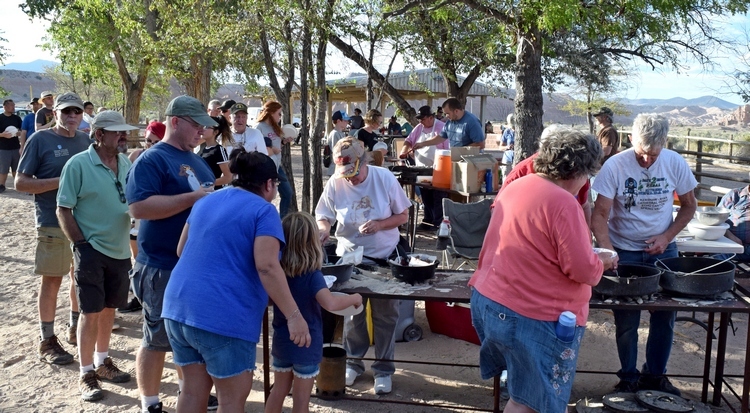 Park interpreter Dawn Andone reported about 20 cooks prepared 40 dishes broken into four categories for judging: bread, dessert, side dish and main dish. A panel of six judges made the decision for first, second and third place, then all in attendance voted on the People’s Choice winner. Of those who were at the cook-off from faraway lands, Monia Diguinmi from Italy said she had been attending a business conference during the week in Las Vegas and, after the conference ended, decided to take about an extra week for a bit of vacationing. She had been to the Grand Canyon, then decided to go camping at a few state parks in rural Nevada. She said she rented a car, a tent and camping equipment, and off she went. The cooks were not all local people, either. Several were from the Vegas area, including Douglas Schmidt and Paul Dicianno, who said they have come up the past four years. “It’s enjoyable. We get to feed and interact with people. It’s a lovely day each time we come.” Neither man is a full-time cook. Schmidt is a mechanic and Dicianno works for a carpet cleaning business. Jack Olsen and his wife were on vacation from their home in a suburb of Houston, Texas, visiting a sister who lives in Douglas County, Nevada. He said the family and some other friends were camping at Cathedral Gorge. People’s Choice, Margaret Ann Garber, Cheesy Enchilada meatballs.